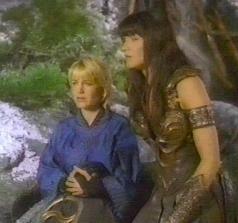 Borias was one of Xena's biggest fans. As the first anniversary of the initial airing of FRIEND IN NEED approaches, the question of whether Xena fandom has changed appears to be a complicated question with many ramifications. However, it is actually not. At the time the show ended its first-run episodes, there were many predictions as to what would happen in the Xenaverse over the coming months and years. Various websites polled users about what the fate of the fans and the fandom would be now that the show that had held them together was over. Most of those poll results indicated that things would be very different. Especially worrisome, for those who wanted the fandom to continue, was the fracturing that occurred over reactions to the finale. The most loud-voiced opinions were those that expressed anger over how the show ended, which in turn sparked anger from those who liked the ending. Throughout the summer of 2001, I personally felt despair that the fandom would ever regain the momentum and enthusiasm that drew me to it in the first place. Since then, I have been both surprised and fascinated at the path that Xena fandom has taken. As I look back at the past year and attempt to evaluate what has happened to the Xenaverse -- or, more accurately, my corner of the Xenaverse -- I first have to look back even further, to my own early days in the fandom. I began watching Xena: Warrior Princess in December of 1998, which would have been near the start of the fourth season. I am amazed now that it took me so long to get around to watching the show. I attribute it to the odd times the show was broadcast in my area, two o'clock Saturday afternoon, five o'clock Sunday afternoon, and so on. I was never watching TV at those times. But that Fall, the USA channel started showing reruns of Xena at six o'clock weekday evenings, and I did have the TV on then. It had been my habit to turn on old Law and Order reruns on A&E at that time, but eventually I had seen them all. I knew at the start who did it and if they were going to get away with it or not. So, I began channel surfing to find something else to watch. I surfed by Xena a few times, each time watching a little longer. The first time I watched an episode all the way through, I was hooked. The episode was THE GREATER GOOD. The mix of fantasy and adventure, drama and humor, and the friendship between two women who were willing to die for their beliefs and that friendship caught me. I then began looking for the first-run episodes of the fourth season. The first new episode I saw was ADVENTURES IN THE SIN TRADE II, which was playing during the winter rerun cycle. Not having seen Part I, I was a little lost and determined to find out all that had gone on before. In my search, I turned to the Internet, where I discovered the Whoosh! website and all of the valuable synopses of past episodes located there. I read them all, but they only made me want to see the actual episodes even more. I eventually found that Season One and Two were available on video, and I bought them, although I was also watching those seasons on the USA reruns. My search on the Internet also turned up the Xena Palace, a graphic chat room that was at that time devoted heavily to all things Xena. I attended "Episode chats" where the latest episodes were discussed and dissected. 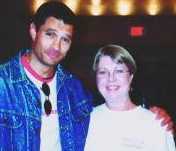 I also attended my first moderated chat, "Tropical Storm" chat # 1, held in June of 1999. The name Missy Good was familiar to me, as she had written several Xena synopses for Whoosh!, but I had never read any of her fan fiction. After the chat, I made a point of looking it up, and immediately got hooked, not only on her versions of Xena and Gabrielle, but also their "uber" incarnations, Dar and Kerry. I spent the summer of '99 glued to my computer, reading Missy's fan fiction. My next step in Xena fandom was a direct result of becoming a Missy Good fan. I discovered that you could get her updates much more quickly if you belonged to her mailing list, so I joined the MerwolfPack list at egroups. The list consisted of over a thousand Missy fans, most of whom were also Xena fans, with the discussion there divided almost equally between the two. I now had what I had been unable to find among my own friends: people who shared my obsession. I felt I was now a part of Xena fandom in a way I had never been before. I could discuss any aspect of the show I pleased, as long as I followed Missy's maxim: "Be nice." I soon branched out and joined several other Xena-related lists, but none were as rewarding as the Merwolf list in terms of avid yet peaceful discussion of the topics I wanted most to discuss. Through discussions on the lists, I discovered Creation Entertainment, the conventions, and the fan club. I immediately became a member, purchased the requisite fan club kits, and began reading about the conventions held all across the country. When I saw that Danielle Cormack was to appear at a convention in Chicago in November of 1999, I was determined to attend. I talked my cousin, who was not really a Xena fan at the time but was up for a weekend in Chicago, into going with me and we ordered our tickets. When I found out that Missy was actually going to be there as well, I was doubly looking forward to it. It turned out to be a great weekend. Claire Stansfield and Ted Raimi were also there, and I began what was to become an extensive collection of autographed pictures of Xena stars. Over the next year and a half I attended two more conventions and expanded my collection of Xena memorabilia to include comic books, trading cards, magazines, jewelry, clothing, scripts, toys, and CDs, as well as the videos of all six seasons. I was in Pasadena in May of 2001 to see Lucy Lawless and Renee O'Connor on stage together for the first time and experience what was -- to me - the peak experience of Xena fandom. Just watching an episode with 4,000 other fans that loved the show as much as I did was a fabulous feeling. I am very grateful that the finale had not aired at that point, because I know the atmosphere there would have been totally different if it had. Gabrielle tries to understand, as we all did. Just a few short weeks later, FRIEND IN NEED did air, and the Xenaverse suddenly became a very sad place to be. Even with all the predictions, I had still hoped that Rob Tapert's statement in Bret Rudnick's Whoosh! interview -- that he would not kill off Xena or Gabrielle in the finale -- might prove true, but my hope was in vain. At that point, the whole fabric of the fandom was stretched to the point that its permanent destruction seemed inevitable. I contemplated leaving the fandom myself, but only for a few distraught moments. When the initial shock wore off, I realized that, though my view of the episodes would always be colored by knowledge of the ultimate ending, I could still appreciate the things I had loved about the show. More importantly, I could still enjoy the camaraderie of the mailing lists and the other fans there. The only "fly in the ointment" was the knowledge that the way the show had ended was still a very sharp issue for many fans. Tempers could still flare over it months after it happened. It was a close thing, but I believe that it was Missy's influence that held it all together and enabled the fandom as I knew it to continue on the lists, albeit with a slightly altered focus. For me, the televised version of Xena was superseded by the fan fiction version. There, Xena and Gabrielle lived on together, since the Journey of Soulmates version had diverged from the televised version some time before. Over the next few months, I continued to keep up-to-date on news of the show and its stars. In October 2001, I attended the Dearborn convention. Although it was rather sparsely attended, due no doubt in part to September 11, the fans there all seemed to be enjoying themselves. It was one of Kevin Smith's last convention appearances, and he and Hudson Leick put on one heck of a show for the fans. I thought long and hard about whether or not to attend the 2002 Pasadena convention. On the one hand, I knew no experience could compete with 2001, and, in addition, I was fearful that there might still be some backlash from disgruntled fans. On the other hand, however, Renee O'Connor was planning to return and appear in the play Love Letters with Michael Hurst. That tipped the scales, and before I knew it, I was on my way to Pasadena again. Little did I or anyone else know that the 2002 con would become as memorable as the one in 2001, but for a much more somber reason. When the news of Kevin Smith's death began to circulate that weekend, we were all -- fans and stars alike -- drawn together in grief. We all began to focus on what we could do to help his family, his friends, and each other in the spirit that has characterized Xena fans since the beginning of the fandom, rather than how we disagreed on the show's ending. This shift in focus seemed to continue after the convention. The edge of anger, which had been a more or less constant presence in the online fandom, was now blunted, as though continuing to complain about the show's ending had become too petty in the face of the tragedy of Kevin Smith's death. 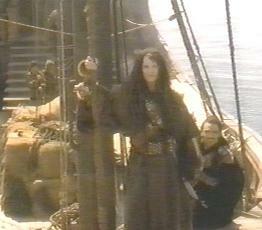 It is surely too much to say that his death erased the anger about the final episodes of Xena, or even that it reconciled opposing views over whether the show ended as it should have, but it did cause many fans to focus on a real life loss rather than a fictional one and to begin to reknit themselves into the fabric of the fandom. As to how fandom has changed in the Xenaverse over the past year, I have to say that, even though tremendous upheaval occurred within that time, surprisingly, I now see very little difference between the present and the time just prior to FRIEND IN NEED. It is as though we as fans have grown older and wiser through our experiences but continue to relate in most of the same ways we related before. I still read Xena fan fiction, now expanded to include several very good Virtual Season Sevens, which feature the "canon" Xena and Gabrielle. I still watch the videos of the six seasons of Xena (since I do not get Oxygen), and have even managed to watch FRIEND IN NEED again (the Director's cut), though it will never be on my top ten list of episodes. I can still appreciate that mix of fantasy and adventure, drama and humor, and the friendship between two women who were willing to die for their beliefs and that friendship. The Xenaverse has gone through a very difficult year but, in my view, it has emerged from it with its fandom intact. There can surely be no tougher test of our devotion. Sally Dye is an episode reviewer for Whoosh! I have taught math and literature to junior high students for so many years that I have lost track of how many. In my spare time I run a county fair, serve as mayor of my hometown, and watch Xena (not necessarily in that order).